Persistent advocacy and legal action by EDC stopped Phillips 66’s proposal to construct a rail spur at its oil refinery in San Luis Obispo County and import tar sands oil from other parts of the country. If approved, the project would have allowed up to five 80-car trains, each carrying more than 26,000 gallons of crude oil, along the California coast each week. This proposal threatened our coastal environment and millions of Californians who live in the blast zone — the one mile evacuation area in the event of an oil train derailment or explosion. 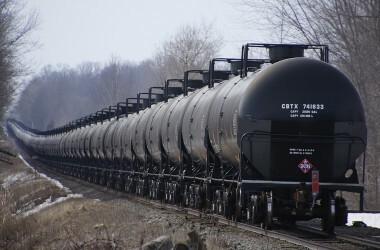 In the last five years, the number of crude-carrying oil trains in the U.S. has grown from under 10,000 to over 400,000 – a 40-fold increase. Unfortunately, so too have the deadly accidents. Across the country, oil trains have derailed and exploded, killing people, polluting the environment, and destroying property. EDC and our clients successfully raised these concerns and convinced the San Luis Obispo County Board of Supervisors to deny Phillips’ proposal. After Phillips sued the County, we intervened and worked with the County to dismiss the lawsuit. As a result, we were able to protect our communities’ public safety, air and water quality, wildlife, and environmentally sensitive habitat. We also averted a carbon-intensive project that would have contributed to global climate change.